I'm sneaking in a few polish swatch and review posts in between my 31 day challenge nails, and the first one I have to show you is four lovely polishes from Aussie indie brand Sayuri Nail Lacquer. 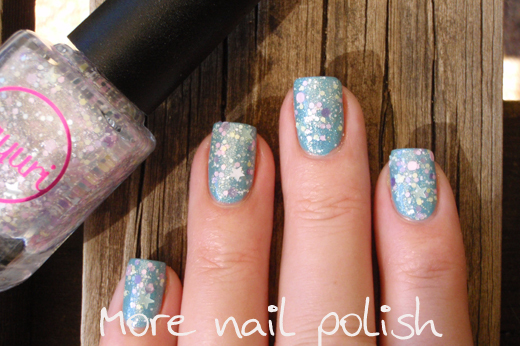 Clouded Skies - a blue creme polish with a grey undertone and silver shimmer. 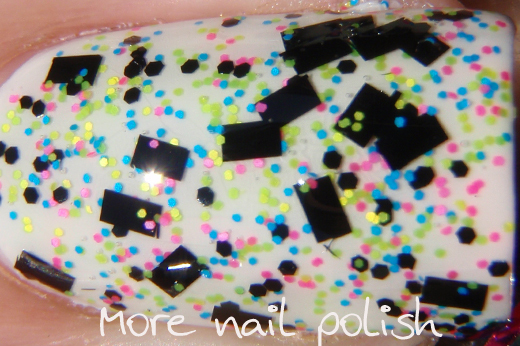 Smooth and easy to apply and opaque in two coats. This is two coats with Seche Vite top coat. 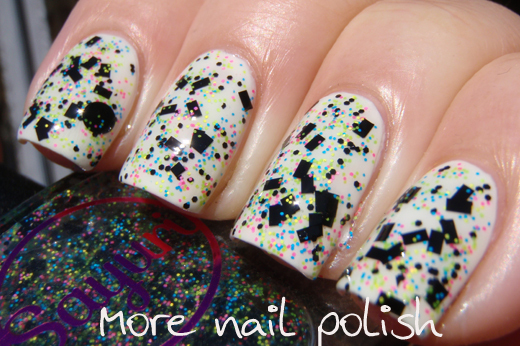 Galaxy Magic - an array of black glitter shapes mixed with neon pink, blue, green, and yellow fine glitters. 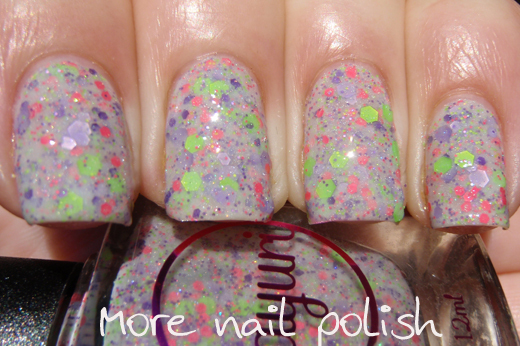 This reminds me of a finer, neon glitter version of Emily de Molly Abstract Canvas, but they really are completely different polishes when I compare them - I just get the same vibe! 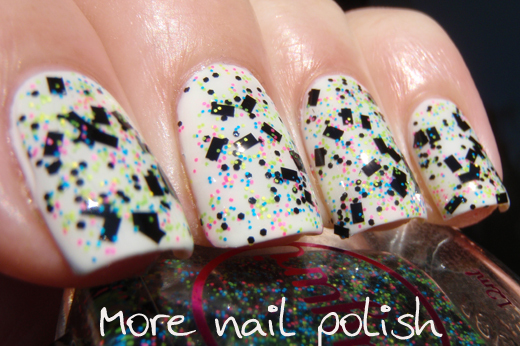 Those rectangular glitters are very interesting, and it's worth noting they are not pesky like bar glitters can be. This is one coat over white. Neo Plasma - an off white crelly base packed with neon green, watermelon pink, grape, and lavender hexes with a fine holo shimmer. This is quite a unique mix of colours in a neutral base. 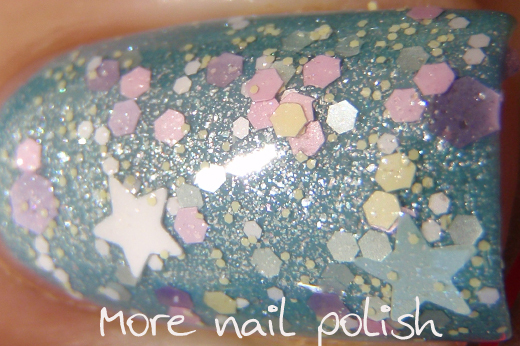 Application is a little trickier because of the crelly base and the amount of glitter, but it only needs two coats for full coverage. I used two coats of top coat to make sure it was really smooth. 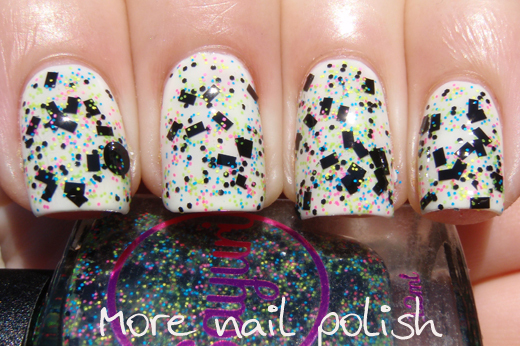 Sugar Coated Dreams - this is a matte pastel multi coloured glitter polish, which is basically the matte pastel version of my absolute favourite Sayuri polish - Love, Sayuri. 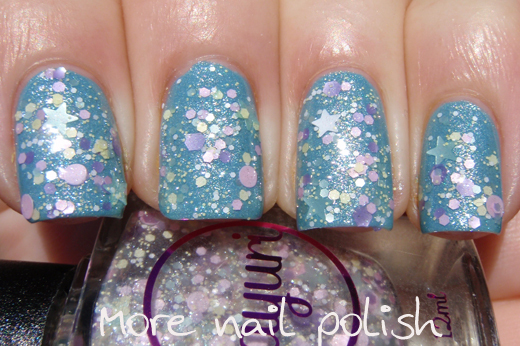 I did one coat over Clouded Skies and I know this would look stunning over white too. 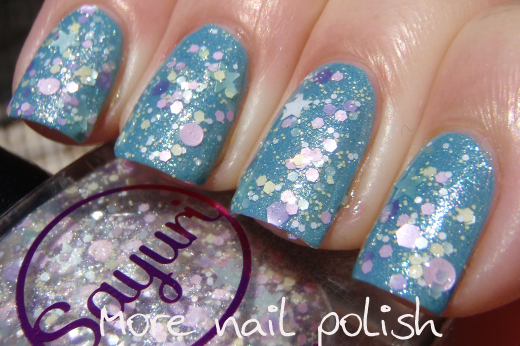 Sayuri Nail Lacquer is available in Australia from their website and internationally through Mei Mei's Signatures. The first shade is so pretty!